12 in aperture (300 mm) for large flats. The FizCam 2000 12 inch aperture Fizeau laser interferometer combines vibration insensitivity and instantaneous phase measurement for highly accurate characterization of large optics including telescope lenses and mirrors. 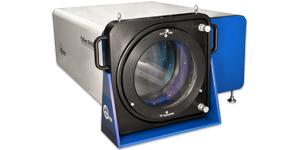 FizCam 2000 dynamic laser interferometers simultaneously capture all phase data simultaneously, allowing high-resolution measurement despite vibration and air turbulence. The FizCam 2000 12-inch (300 mm) aperture system is ideal for measurement of large diameter flats. An optional extended path-matching feature enables cavity lengths to 2 meters. 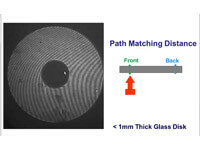 The FizCam 2000’s proprietary laser source enables measurements which would otherwise be difficult or impossible, such as measurement of thin, plane parallel glass. The system can also measure “remote cavities,” in which both the test and reference surfaces are physically separated from the interferometer, as when measuring large telescope and satellite optics. Compact laser interferometers for quality verification of optical components and systems, in the lab or on the shop floor. Vibration-insensitive, compact systems for measuring convex, aspheric and flat optics, even in extreme environments. 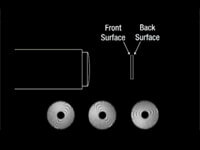 Portable dynamic optical profilometers for measuring surface roughness of large and small optics and precision components, despite vibration and turbulence. for roughness measurement and defect quantification of roll-to-roll processes. Compact, high resolution, shop-floor tough tools for measuring surface defects. Small, fast, field-proven sensors for image enhancement, process control and polarimetry measurements. Purpose-built optical metrology instruments that overcome difficult environments, complex setups and challenging measurement applications. Data acquisition, analysis and visualization tools for use with 4D instruments or for stand-alone operation. Hardware and software solutions for greatly improve performance of laser interferometers from Buccini, Zygo (Ametek), ADE-Phase Shift, Bruker (Veeco, Wyko), and others. How did you hear about 4D? Can we occasionally contact you with information regarding 4D Technology products and services? We are committed to keeping your data private, and you can change your subscription preferences at any time. Yes, it is OK to send me information and updates via email. 4D's patented wavefront sensors enable vibration insensitive Dynamic Interferometry. US Patents 6,304,330, 6552,808, 7,230,717, others. Other patents pending. 4D Technology dynamic laser interferometers use proprietary, high speed, high resolution wavefront sensors to measure the shape of optical surfaces with extreme accuracy despite vibration and environmental noise. In a conventional phase-shifting laser interferometer, multiple frames of data are acquired over many milliseconds—enough time for vibration and turbulence to degrade the measurement results. In a dynamic interferometer, all phase data is acquired simultaneously, in as little as thirty microseconds. This speed enables 4D dynamic interferometers to measure in noisy environments, despite vibration solation or air turbulence. Dynamic interferometry® enables complex tests between multiple unisolated tables, measurements in environmental chambers, and measurements with long stand-off distances. Odd shapes, pupil obscurations, poor signal contrast, moving parts, air turbulence and mechanical vibration are not problems. Special wavefront sensors have also been developed for wavelength insensitivity, higher spatial resolution, and applications within tight space restrictions. 4D Technology’s products are rigorously tested to ensure years of quality service. All 4D products are warranted for one year against defects in material and workmanship. The 4D warranty covers parts and labor, including field service if applicable. At the time of system purchase, for added protection you can choose to extend the basic warranty for up to 3 additional years.